Doesn’t Emma look gorgeous? 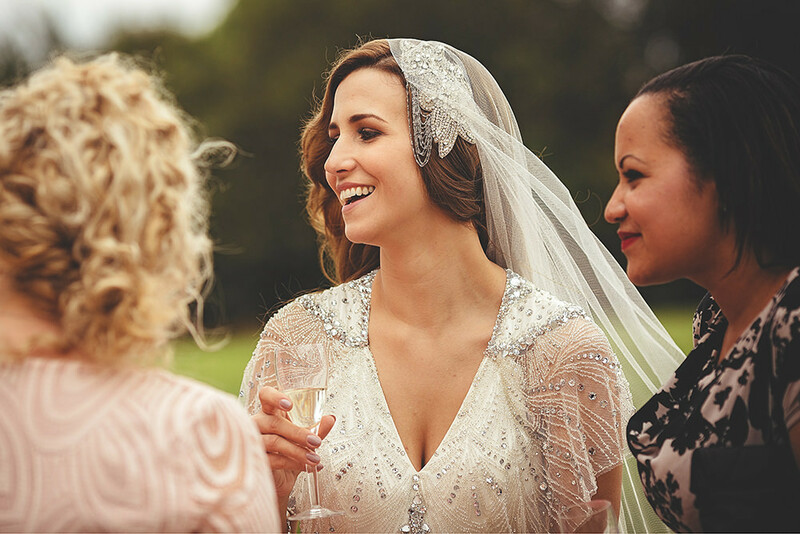 We’re all swooning over her Donna Crain headpiece and of course, the Nicole gown by Jenny Packham. 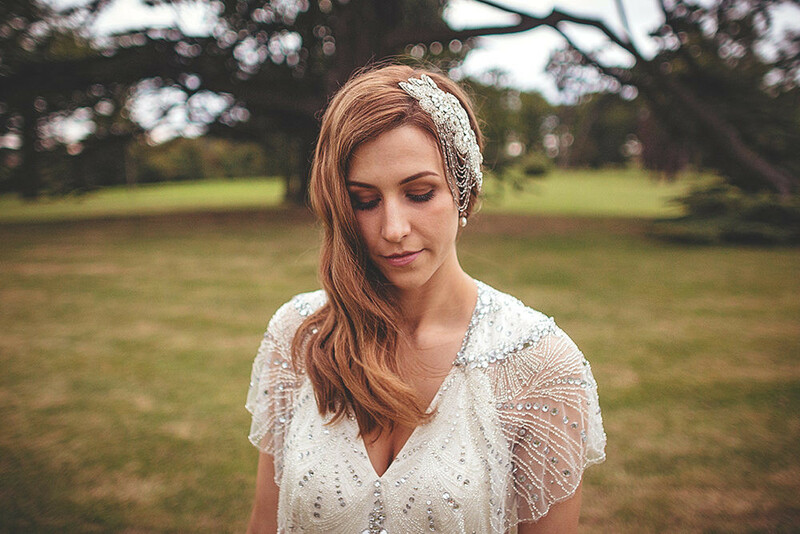 It’s such a sparkly, glitzy dress to get married in and we can see why Emma fell for it – THE perfect dress for an elegant art deco inspired celebration. Emma and Nick had a two year engagement, and have a gorgeous son together, so their day was a celebration of their family, as well as their marriage and the images of Emma walking down the aisle with her son, and her Dad, towards her future husband will make your heart melt, I guarantee it! 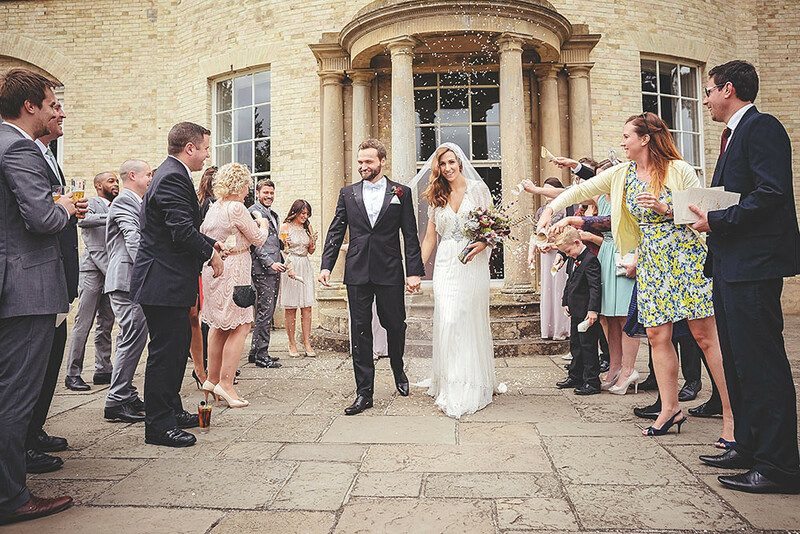 Emma The Bride: Very quickly following our engagement, I fell in love with the dresses by Jenny Packham. I became so obsessed with her that when I eventually attended a Jenny Packham designer day at Emily Eve Bridal in Birmingham, I knew the name of every design in the shop! I tried eight of her designs on, but none seemed to suit me, until I came across one dress that I had never seen before – the Nicole. It wasn’t what I had been searching for at all, especially with its low cut neckline, but as soon as I put it on I did not want to take it off. When I popped a veil on with it, I began to cry happy tears, and I just knew that would be the dress I would wear to marry Nick. I wanted a striking headpiece to match the heavy embellishment of my dress but could not find a design I loved. I had trawled every website, shop and boutique, from Nottingham to London, but could not find anything to complement the dress. Weeks before the wedding, my Mum and I drove the six hour round trip to Sussex to visit Donna Crain’s studio, and there I found my beautiful piece. Donna’s attention to detail is second to none, and I loved the intricate beading of the piece and the movement of the chain detail against my face, which really suited my Deco look. I was lucky enough to meet some wonderfully kind suppliers, but Donna left a lasting impression, allowing me to take the design home to try on at my dress fitting, trusting that I would send it back when I had decided. Donna was wonderful, altering the design slightly to ensure it sat perfectly at the front of my face, and removing the leather backing to make it vegetarian friendly. I left my wedding jewellery until the very last minute – two weeks before the wedding and I was desperately browsing the Liberty in Love website when I finally decided on an earring and necklace set by Stephanie Browne, which came with a six week wait time. Luckily, Tabby managed to get these sent directly to me from Australia, and they arrived just days before the wedding. I loved the soft pearls, and the small crystals matched my headpiece without competing. I couldn’t find a veil that I liked. I desperately wanted a mantilla veil, but didn’t think lace would suit my dress. In the end I bought a raw edge mantilla from Etsy which sat over my headpiece. I never intended to wear it beyond the ceremony, and this was easily removed for the wedding breakfast. Nick decided early on that he wanted the male wedding party members to be in black tie. Nick opted for a white bow tie to set him apart from the others in the party, which might not follow white tie etiquette, but we thought was a subtle compromise. We fell in love with our venue on our first visit and were lucky enough to secure the last remaining summer date on our visit almost two years before the wedding! Nick and I decided very early that we wanted to emulate the glamour of the 1930s. We had waited over seven years to get married and both wanted the day to be a huge celebration, so spent almost two years planning. Not everything went as planned, but it was perfect, and there is nothing we would change. 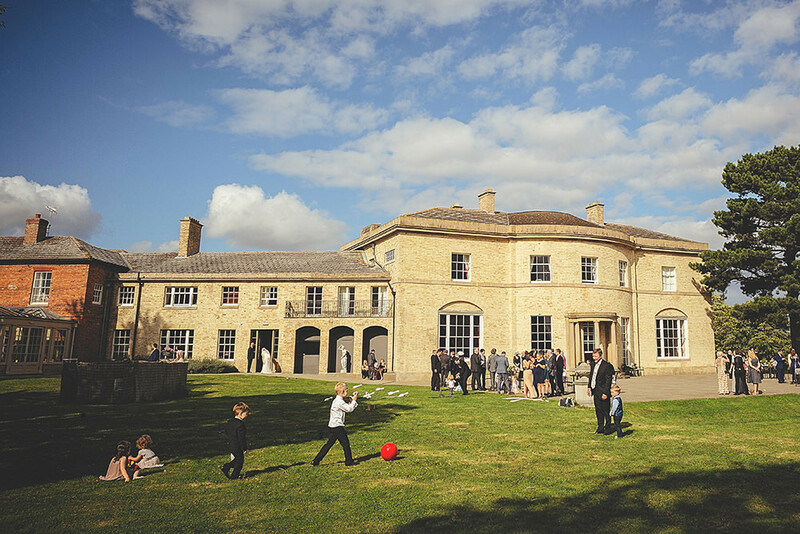 We married at Stubton Hall, a large private manor house in Newark. We loved the mix of the traditional oak panelled bar and reception room, and the beautifully light, white washed Music Room. The house sits on large, well-kept grounds, with a striking Willow tree and huge pond. The venue were wonderful in allowing us to organise the day as we liked, and put us in touch with some fantastic suppliers. In the evening we had a cocktail bar, serving a range of our favourites. The party was amazing and the dance floor was always full! We decided early on that we didn’t want a colour scheme. Slowly it emerged that we wanted the flowers to take centre stage and to be the only thing to add colour. Our florist ensured that the juxtaposition of the rich, deep reds and light peach tones in our flowers brought the glamour needed to suit our 1930s inspired look. 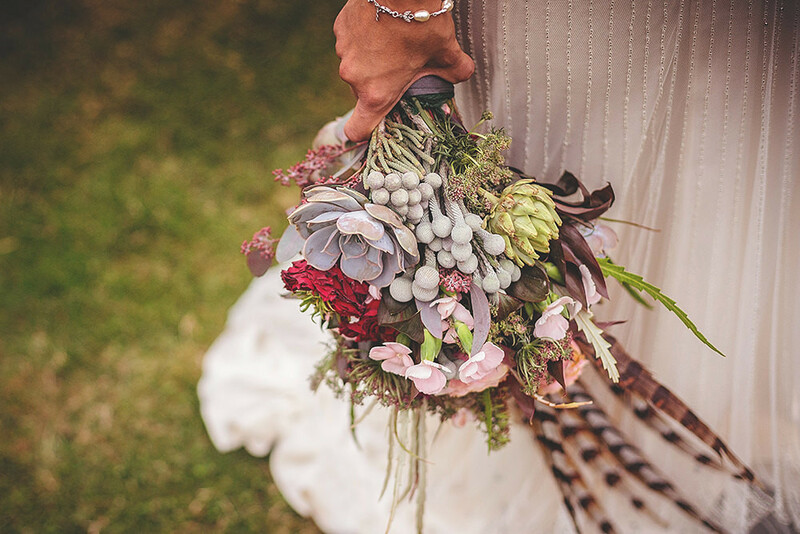 The partridge feathers, all ethically sourced, looked amazing alongside the succulents, standing out amongst the soft roses. The huge 4ft candelabras gave a dramatic look to the tables. The flowers on the top tables were just wonderful; black dahlias, tall soft peach roses, succulents and artichoke heads. Marc at Vaas knew that we wanted the flowers to dominate the tables and were relying on them to bring all of the decoration, and he really delivered. The flowers took centre stage, and we could not have been happier with them. We added small decorative votives to the tables to match the candle light from the candelabras. We tried as much as possible to do things ourselves and I really threw myself into the details. Our favours were assorted glass heart baubles by Nkuku which I bought in bulk, then individually hand tied on to deep red velvet ribbon. Our stationery was designed by an American Etsy seller, umama143, which was a painstaking process at times, but worth every second. 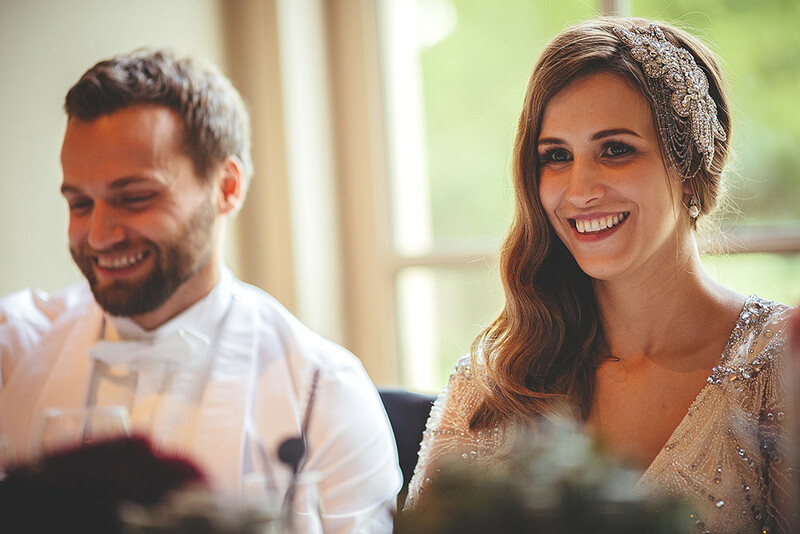 Nicole at Umama worked on the design for months – from our Save the Dates, to our wedding day stationery – and we developed the designs over messages until they were perfect. With her being an American designer, she sent the finished files and I printed everything on to linen card and cut it all by hand, from Orders of Service, to hexagonal place names. It was very time consuming, but we ended up with bespoke stationery at a low cost. The only thing we had to pay to be printed was our A1 table plan, so we saved an absolute fortune. I managed to cut costs on our sweet table by creating it myself. I picked up a job lot of cut glass on eBay from a lovely lady who was clearing out her elderly mother’s house. We hired a sequin table cloth and arranged the glass dishes amongst antique sweet tins and antique books we had rescued. This worked out much cheaper than hiring a sweet cart, and I think looked much prettier too! 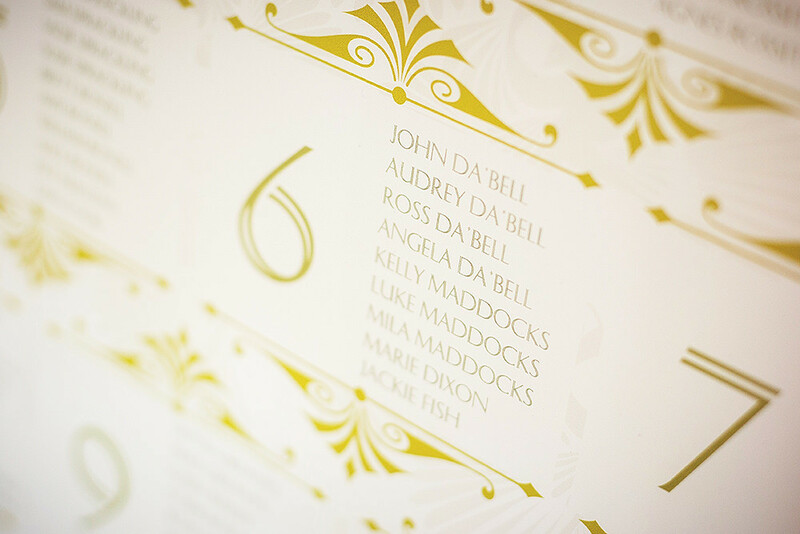 One of my favourite details from the whole wedding and something which I will always cherish is our guest book. I found Spellbinderie on Etsy, a lovely seller who specialises in creating guest books from antique French books by removing the pages, rebinding the books and adding a hand stamped brass plate. Our guest book started out as an early twentieth century novel and is in the most beautiful design. I love it. The bridesmaids were never supposed to have matching dresses but both loved the first dress I ordered for them to try on. Incidentally, their dresses were also by Jenny Packham – though from the No1 collection for Debenhams! They wore capes by Biba. The ceremony was not seamless. 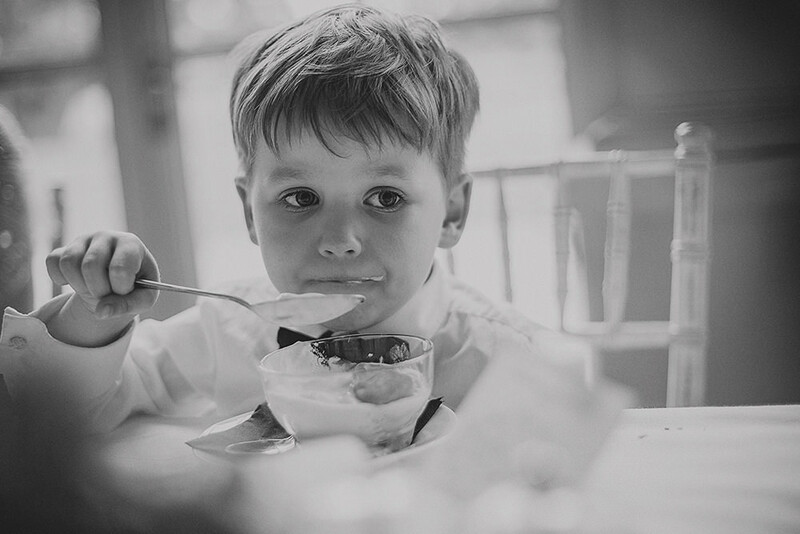 Our beautiful, sweet, shy, barely four year old boy, Oliver, decided as he was walking through the door with our page boy and flower girl that there were too many people there to watch, and that he would not go any further! I walked down the aisle with two of my favourite men; my lovely Dad and my son. At the time it was everything I had been dreading, but that is what children do, and he was still there to see his parents wedding, which was as much about him as about us. Luckily, a glass of juice and some garden games got him in the mood to party quickly after the ceremony! When I think back to the ceremony, marrying Nick feels like a dream. I still remember us holding each other as all of our loved ones applauded, and then resting against each other’s forehead. It was a completely overwhelming sense of completion and elation. In our heads, I’m sure we were both saying ‘we did it’! We chose a harpist to play during the ceremony and drinks reception. Our first holiday together was spent in Paris, seeing the harpist Joanna Newsom play. The night Nick proposed in St Ives, Cornwall, we saw a harpist busking on the harbour front. We have always loved the instrument, and it was a beautiful addition to the day. We asked my lovely Mum to read Aristophane’s speech during the ceremony. It felt important to include her during the ceremony, as a way of expressing how important she is to us both and how big her role had been during the planning of the day. My Mum attended every appointment and was always there with advice when I needed it. Her reading during the ceremony was a special moment. 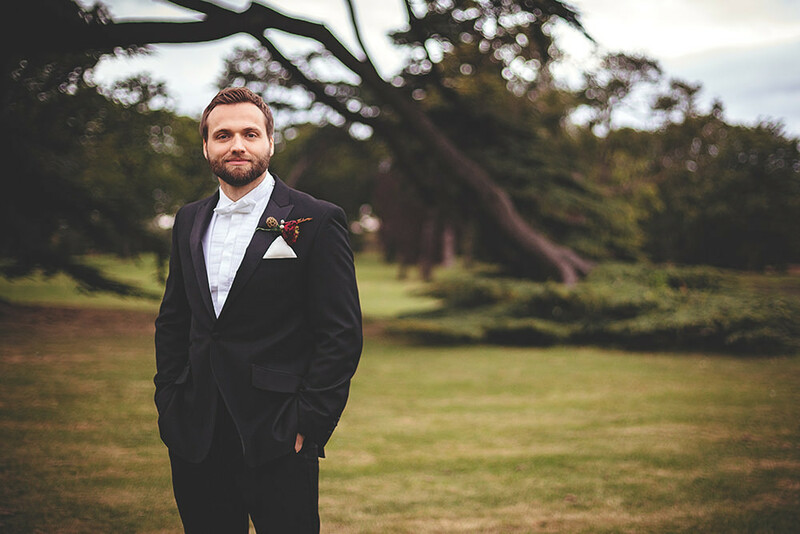 We booked a vintage wedding singer, Simon Partridge, who we stumbled upon at the first wedding fayre we attended. His authentic, beautiful vocals set the tone over dinner, and his music became one of the most complimented aspects of the day. He played some songs in remembrance of lost loved ones and was an absolute pleasure to have there. The speeches were amazing. My Dad has always been a brilliant writer and his speech was both heart warming and embarrassing in appropriate measures. Seeing him so nervous beforehand and wanting to make me proud brought tears to my eyes. He was amazing – finishing with a toast to ‘the happy family’. Seeing Nick making his speech and expressing his love for me to all of our guests was one of my most cherished parts of the day. It just made the day exactly what we wanted – a huge celebration of love. Nick’s best man ensured that Nick was suitably embarrassed during his speech – pulling out archived footage from Nick’s old modelling days and projecting them against the wall. It was the perfect lead up to the party! We were blown away by our cake! Four different flavoured hexagonal tiers, adorned with a beautifully intricate mandala/Deco design. It was simple and stunning and tasted phenomenal. 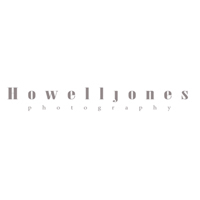 We booked Warren at Howell Jones Photography after seeing his pictures on a blog. We love his natural, documentary style and the beautiful filters he uses on the shots. I am a very awkward poser, and love the fact that he managed to capture so many beautiful moments without us realising he was there. Warren was wonderful to have there and we are so happy to have such beautiful photographs as a lasting memory of our day. In order to capture a true representation of the day, we hired cameras from Shoot it Yourself. The footage was edited into a 45 minute video, all filmed by our guests. I would really recommend this – some of the footage was absolutely hilarious, and would never have been captured by a professional! We always knew that our day would be centred around children, having over twenty under eights there to celebrate with us. We filled the lawn with garden toys from eBay, and I spent hours putting together bags for the children. I filled each bag with age appropriate bits – vintage stocking fillers, colouring, bubbles – and my bridesmaids filled white helium balloons on bracelets for them. These were a nice way to keep the children entertained at the table, without taking them away from the celebrations and time spent with families. My bridesmaids spent a lot of time planning the day with me and I really couldn’t thank them enough. It became a hobby for us all! It was wonderful to have my best friends there for help and guidance, and the day would not have been the same without their input and support. The lasting memory of our day was Nick swinging me around at midnight to ‘Never Forget’ by Take That, while everyone surrounded us, singing at the top of their voices. I think our wedding will be remembered as a party, full of love, fun and laughter – and that is all we hoped for and more.